At 'a' or 'b' ? White's turn. Yose, some stones in the center are not shown. Which move is bigger? Alex Weldon: Given than this has been unanswered forever, I might as well take a stab at it, even though I'm no endgame whiz. 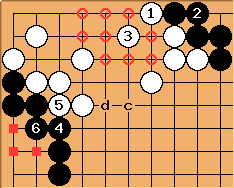 Ignoring the center, since we don't know what's there, answering at a gives White 9 points, assuming that we're counting the corner points as fixed, and that the situation in the center allows Black to reduce at c and d in sente at some point. Black has 3 (again, assuming his territory down the side is fixed). The total is 6 for White. After , and will be sente. will probably be answered at . 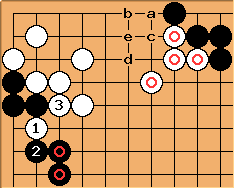 Later, there are a number of gote plays for both players. It's hard to know exactly what White will get, but probably at least some of the circled points, so let's say 2 or 3. 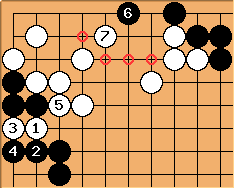 Since the total in the previous diagram is 6 for White, and here White gets 6 on the left (3 territory + 3 prisoners) and Black gets nothing, b is points-wise better than a by however much White gets on the top - a few points, anyway. However, White ends in gote this way, and in sente by answering at a. Therefore, to choose between these two moves requires one to estimate the value of sente. If there are moves bigger than two or three points elsewhere, a is better. Imagist: A generalization of this case is at mutual damage. Bill: As is often the case, there is not enough information to give a definitive answer. Assuming the stones are secure, - gains 4 1/2 points. But if the stones are not secure, Black can probably play at c with sente, threatening to play at, say, d, using their weakness to march into the corner. In that case White should reply to Bc at e, and Bc is a 5 point sente.